Turkey attracts many tourists and terminators. Most of them say that this country provides an excellent GSM-communication. Sometimes there are shortages in the eastern part of the state, where there are mountains and highlands mostly. However, you can connect to Turkcell, which provides the good coverage to stay connected. 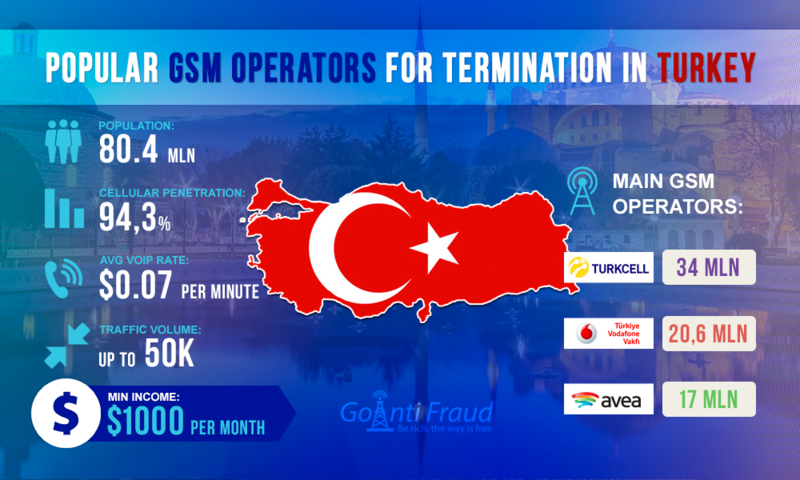 Terminators should take into account that GSM-communication has become so popular among the users in Turkey to an extent that it is gradually replacing all other means of telecommunication. Thus, of the total amount of the country's population of 80,463,633 million people, 73.6 million subscribers use mobile phones. And we can say with certainty that voip termination services in Turkey will be successful. Three mobile operators divide GSM-market in the country: Turkcell, Vodafone, and Avea, with the former leading in terms of quality and the number of subscribers. Its services are used by 71.55 million people, which is 97.21% of the total number of subscribers. Turkcell covers 98% of the country. Vodafone has a customer base of 21,870,000 users, Avea - 17 million. Their coverage is approximately 30% of the market. Turkcell provides the best coverage. At the same time, the services of the aforementioned GSM leader cost more than those of Vodafone and Avea. Therefore, terminators find Magnificent Tariff of Avea the best package to terminate calls, with a mandatory prepayment of $11.35. When you connect your gsm voip goip, one minute call will cost as little as $0.00091. Avea offers 900 minutes to make calls within the network, which is optimal for the termination. However, because of weaker coverage it is better to connect the equipment in major cities. At the same time, most of the terminators prefer Vodafone’s unlimited tariff Red Elite as it the operator provides better coverage. However, a minute of conversation costs about $0.0055, when you connect to this package. The majority still chooses Turkcell and connects to its low tariff plans Turbo 4GB and Turbo 2GB. Onet minute will cost from $0.0011 to $0.0014. To connect to these packages, you need to make an advance payment in the amount of $15.84 or $19.07. A Voip Gsm gateway to terminate via Turkcell packages can be installed anywhere - in a big city or a small village, because the conditions of connection and excellent coverage across the country allow making an average of $1,136.52 a month.